LOICK PIRES is keeping his feet firmly on the ground after running Barrow ragged on Saturday. Cards’ level-headed hit-man turned in the performance of the season as Woking crushed the Cumbrian’s 3-1 at Kingfield. Pires drilled home a decisive third in 79th-minute as Garry Hill’s men battled back from a goal down to make it six points from a possible nine this season. And despite rave reviews from his manager and fans alike, Pires refused to get caught up in the hype, instead focusing only on Saturday’s game with Forest Green Rovers and the chance of another three points. After netting his first competitive goal for the Cards, the forward said: “It’s always good to get off the mark as I striker – scoring goals is what we are bought to do and I felt good against Barrow. “It was a massive relief on my part but now I can look forward to the next game and try to build on that. “It was always going to be a battle with the heat but I finally showed what I can really do. “In the first two games I was a bit quiet by my own standards but things started happening for me on Saturday and I was pleased to get the three points. “As a young player I’m looking for consistency and to try and improve in every game. “I know what football is like – there are games when we all look good, but then there are some days when that might not happen. His bullish performance, coupled with a result that lifts Woking up to seventh in the table, had Hill swooning come full-time. In his post-match interview the Kingfield boss backed Pires to bag a minimum of 15 league goals this term, a prediction that did not faze the striker. Pires said: “If the manager believes in a player then they are already halfway there. “I know what I can do, the manager knows what I can do and it’s up to me to play my part in the team. “If I get 10, 15, 20 goals then great but I’m not putting too much pressure on myself. Pires revealed the Woking dressing room was oozing with confidence after a superb start to the season and that there was no chance the Cards would settle for just a point in their next fixture. He added: “We go into every game wanting to win, we are an ambitious team and an ambitious football club. “There isn’t a team in this league that we’ll sit back against and try to consolidate for a draw. “Once it’s eleven vs. eleven we know we can beat anyone on our day. “I think you can see with the signings the gaffer has made that although we want to be solid defensively, we want to show what we can do in attack. GARRY HILL praised the character of his determined Woking side as they battled from a goal down in a Kingfield furnace to see off Barrow. The Cards showed great resilience in blistering temperatures to hit back after Garry Hunter’s placed strike had given the visitors a 15th-minute advantage. Joe McNerney, promoted to free-kick duty in the absence of Giuseppe Sole, conjured a goal the injured striker would have been proud of to pull Woking level after 20 minutes. And despite twice being saved by the woodwork, Cards never looked back, securing victory with second-half goals from Bradley Bubb and Loick Pires as Hill revelled in a second Kingfield triumph in five days. And the delighted manager believes his side have what it takes to give anyone a run for their money this season. He said: “We knew it was going to be a tough game but I think we showed a great deal of character. “They were the better team in the first 20 minutes and they got the goal they deserved. “They hit the post before that, the warning signs were there but I think the big thing in this league, which we’ve already started to show, is we’ve got character. “I know the league, I’ve been in the game a long time and I’ve instilled into the players that they’ve got to have character, desire, passion and they’ve got to be winners. “For periods in the second-half it was all one way, we really took the initiative and showed them that we wanted to win this match – it was a big win today. “If we put our honesty and commitment into every game then we can make it hard for teams. You can’t have days when you fancy it and days when don’t at this level – you’ve got to be up for it every game. “I think it’s a very good start but it’s no secret that we want 50 points. When we get to that 50 points I’ll punch the air because that will be the first hurdle. “We play against clubs in this league that are far superior financially to us but they can only put 11 out on the park at once. 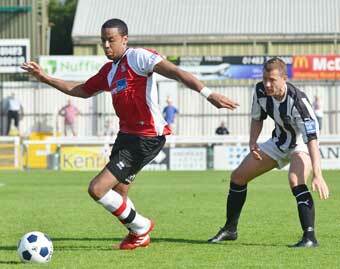 In an electric opening period Woking had the chance to take the lead as early as the second minute. Persistent pressure from Pires forced Danny Hurst into picking up Mike Pearson’s heavy back-pass inside the penalty area. The keeper received a caution for his troubles and the Cards were awarded an indirect free-kick eight yards from goal. Bubb failed to force Lee Sawyer’s lay-off through a wall of black and white shirts and the danger was eventually cleared. Aaron Howe needed to be alert to keep out James Owen’s deflected shot from 18-yards, but there was nothing the Woking stopper could do to prevent Barrow taking the lead. A sweeping surge forward resulted in Hunter curling an effort back off the foot of the post. But within 30 seconds the lively midfielder did have the ball in the net, measuring a fine effort from the edge of the area past the static Howe. Pires rattled a fierce drive against the near post after being released down the left channel by Brett Williams two minutes later. And having only trailed for a matter of moments Woking released the Beast to drag themselves level. Kevin Betsy’s marauding run was unfairly hacked short and, in the absence of Sole, McNerney stepped up to take set-piece responsibility. What the defender produced would have received the seal of approval from Cards’ injured dead ball specialist. From fully 25-yards, McNerney found the smallest of gaps in the wall, bending a stunning strike into the bottom left corner. With the contest well and truly at its peak both teams had chances to take the lead before half-time. Barrow went close with Sean Hessey’s thundering free-kick that flew just wide. 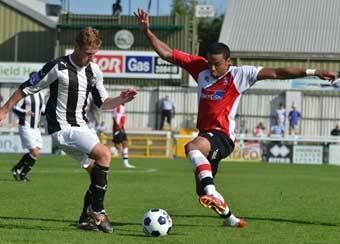 For Woking, Pires had a shot cleared off the line by the stretching Gavin Skelton following Williams’ smart pass. But the woodwork had to come to the Cards’ rescue a second time when Adam Boyes’ masterfully crafted volley beat Howe. Under the scorching sun the tempo took an understandable knock in the second-half. But with Barrow flagging in the Kingfield furnace, Woking got their noses in front thanks to Bubb’s second goal in three games. Pires, who led the line excellently from start to finish, was hauled to the ground down the left. Sawyer stepped up to flight in a cross and it was on-loan Aldershot man Bubb who applied the vital touch to help the ball loop over Hurst and into the far corner. Buoyed by the breakthrough, Cards chased a decisive third. Brett Johnson did his best to turn an awkward header into the top corner but was denied by Hurst’s safe hands. But Barrow would have been on an even keel if not for the timely block of substitute Gavin McCallum. A quick free-kick found substitute Vinny Mukendi in a pocket of space at the back stick, but his close-range stab at an equaliser was foiled by the outstretched leg of McCallum. It was fitting that Pires would seal the points after such a tireless, selfless shift. Betsy picked the ball up in the middle of the park and surged forward on a trademark run. His threaded pass was to perfection and after a neat touch and a moment to compose himself, Pires drilled home a 79th-minute clincher, much to the delight of his manager. Hill added: “Loick has shown why we’ve fetched him into the club. “He’s not the finished article just yet but he’ll get goals in this league if he is prepared to listen to Steve Thompson and myself. “He’s a big unit, he’s mobile, he’s got a left-foot on him and I expect Loick to go and get 15-20 goals this season.